If you want more details about this property, call me today! Currently, this development is sold out but there is an assignment opportunity for you to take advantage of! Invest in Your Future – Your Opportunity to Purchase at Marquee Lougheed Heights! Whether your plan is to rent out the unit, live in, or hold – Marquee Lougheed Heights is your opportunity to invest in your future. Rentals are allowed at the Lougheed Heights. For a unit of this size and age in Coquitlam West/Burquitlam area the rental rates are going for $1500-$1900/month. , and being close to Lougheed Town Centre, the freeway, a skytrain, and Simon Fraser University results in Marquee Lougheed Heights being located in one of the tightest rental markets in all of BC! There are always a high supply of students looking for a property to live in, and with easy access to busses and a growing community the neighbourhood is also attractive a number of families, couples, and more, which is also increasing rental demand. Have a tenant help you bring in passive income/pay off your mortgage while you hold the property and wait for this area to continue flourishing. The Burquitlam/Coquitlam West neighbourhood is becoming increasingly popular for families, students, and couples/singles. With a number of existing amenities and new additions to the area, including schools, daycares, restaurants, grocery stores, and more, everything is within walking distance. The bus station is just minutes walk away, allowing you to get to anywhere in Burnaby, Vancouver, and other areas with ease. Marquee Lougheed Heights facilities offer a wellness centre & gym for resident use, and is a luxury development that will set new standards for the area. Whether you live in it or hold the property, Marquee’s location & building allow you to enjoy your time at Marquee Lougheed Heights while also investing in your future. Bridgewell Real Estate Group has an assignment for sale at Marquee at Lougheed Heights which will allow you the opportunity to purchase in this sold out development! Estimated completion is early 2020! Crossroads for the development are Foster Avenue and North Road in Coquitlam. Lougheed Heights Coquitlam West location is in the heart of Burquitlam – an upcoming neighbourhood with local shops and restaurants that is close to the freeway and Lougheed Town Centre. This leafy residential street is close to local shops and restaurants—and just two blocks from the wooded trails of Como Lake. It’s the heart of a connected neighbourhood and the perfect place for spending time with friends. The three-phase development is expected to complete in Late 2019/early 2020. Developed by Bosa & Blue Sky Properties, and architectural design by Chris Dikeakos Architects Inc. Lougheed Heights is built by Bosa developers, a family-run company that has a reputation for quality, integrity, and innovation that has been in the business for more than five decades. BlueSky Properties and Bosa Properties have collaborated on the construction of this tower to bring both their world-class design and reputation to life. With over 50 years of homebuilding experience, it is no surprise that the developers outdid themselves on this project. Original deposit structure was 25%. Assignment of contract advertised has a total of $94,475 deposit. Dens do not have a window or closet. The closest skytrain station is Burquitlam station, which is walking distance (less than 5 minutes) from the Lougheed Heights development. The community offers direct access to the Evergreen SkyTrain line, which provides fast and convenient service to downtown Vancouver and Coquitlam City Centre. The 29-storey Marquee, located next to North Road, is the final condominium and townhouse building within the development. The 242-unit structure will contain 17,000 square feet of its own amenity space, including a pool deck, kitchen-equipped social lounge, dining room, and barbecue terrace. Marquee offers sweeping views of the mountains and SFU from the North and West side of the building. 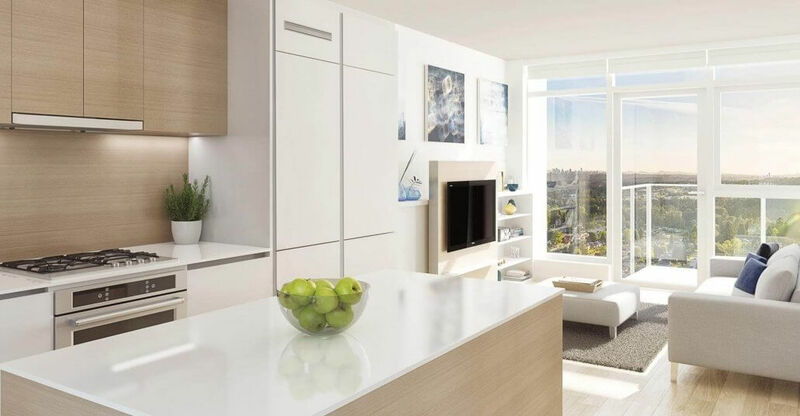 The first two towers at Lougheed Heights hit the market contemporaneously. Offering 336 units between them, the 39-storey tallest tower, located in the middle of the complex, meets the street with a low podium topped with an outdoor amenity space. Investor alert* Rentals are allowed! For a unit of this size and age in Coquitlam West/Burquitlam area, the rental rates are going for $1500-$1900/month. Fantastic rental opportunity as you are close to Simon Fraser University, skytrain and more. This 1 bed 1 bath assignment of contract features an open 517 sqft interior with an added 109 sqft balcony! ExtenTABLE – the kitchen island transforms into a dining table or desk, seating up to 8. Most units come with 1 parking stall and 1 storage locker. Tower 1 and 2 are a combined strata, and share an amenity space. Marquee – the third and final tower – has its own strata and therefore has exclusive access and enjoys over 17,000 square feet of ITS OWN playful space. With over 17,000SF of private amenity space, homeowners will have plenty of space to connect, recharge, or relax in this complete community that even offers retail opportunities. Unit 2306 Marquee, Lougheed Heights IS AVAILABLE TO PURCHASE! Estimated Time of Completion: Early 2020 ~ MOVE IN SOON! BONUS: $7,000 will be credited upon completion for decorating allowance. Contact your realtor or Mariko (604-765-0376) for more details! Unit 2306 is still available! Contact your realtor for more details.